If you are a fan of TaylorMade clubs, then you already know about their inverted cone technology. This technology was originally developed for their drivers. It's CNC-milled directly into the back side of the golf club. This allows TaylorMade to drastically vary the thickness of the clubface. This results in a bigger COR zone. What the heck is COR? COR is the spring effect or trampoline effect of the club that makes the ball jump off the face like a kangaroo being stung by a bee. In addition, the Burner irons have TaylorMade's new fandagled Superfast technology. This technology includes lighter shafts and grips with higher launch angle faces. Together, the Superfast and the inverted cone technology make this one of the most game-improving irons on the market. 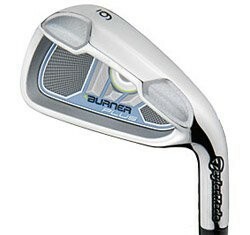 I would recommend these irons for you ladies that are looking for more distance with an extremely forgiving clubface. Other good irons in this department are the Callaway Diablo Edge Irons Hybrid Combo Set. I like this set because of the cool graphics that hide the cavity back design. I also like the Cobra S2 Max Ladies Irons.